Sauk Valley Community College is one of the best colleges in the nation to work for, according to The Chronicle of Higher Education. The results, released in The Chronicle’s eighth annual report on The Academic Workplace, are based on a survey of more than 53,000 people at 253 institution colleges and universities across the country. 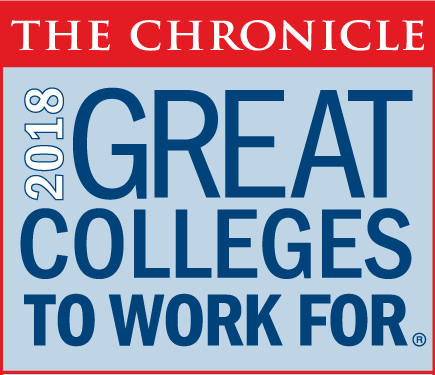 As one of the largest and most respected workplace-recognition programs in the country, Sauk is very proud to be recognized by The Chronicle Great Colleges to Work For® program. We are pleased you are considering joining Sauk Valley Community College. Our close-knit community is dedicated to helping students become informed, involved, and productive leaders. Bringing our mission statement to life are talented, dedicated staff and faculty who teach, mentor, coach and inspire. We believe the best people work right here at SVCC. Working at SVCC means making a difference in the community and in the lives of our students. Sauk Valley Community College is a comprehensive community college located in a picturesque rural setting in northwestern Illinois. Located along the scenic Rock River, between the cities of Dixon and Sterling; the College is one hour from Rockford and the Quad Cities and two hours west of Chicago.